DONGYANG PARK was established in 2014 with many specialists in engineering, manufacturing, installation and marketing. All team leaders and specialist joined here, so we could achieve domestic market share 10% for 2 years only and ranked top 4th in 2016 and 2nd rank this year. We own our factory (approx. 7000 m2) in Korea and will open a new factory this year. The new factory will be used for oversea projects Our product is more optimized and efficient. For example in TOWER PARKING, we install the trolley at under LIFT to minimize the height but other company does not. It may lead we can secure one more level within height limit. We are currently exporting Japan, India, Vietnam, Colombia, Costa Rica and Saudi Arabia. After establishing in 2014, we begin the oversea projects in earnest from this year and accomplishing project as below in 2017. TP type is the latest mechanical multi-level park much more car promptly and safety in the limited space, it is possible to perform the parking and retrieving process for a sedan and a SUV at the same time as drive forward in parking and retrieving process with inner turn-table and vibration and noise for the building is less. •With the less operational noise and vibration, it is suitable for a hospital, mid to big scale building and for residence building. •It has high space efficiency with various forms depending on the building design. •The system and function is simple therefore the rate of malfunction is less. •It is enable to manage the system with minimized personnel due to integrated management type by the computer monitoring system and touch screen. •It is ensured safety by the steel structure design made allowance of the local wind velocity and seismic conditions. GP type is that 1 or more lift(s) which share numerous storage tiers and cart(s) for each tier which forward the loaded car between the lift and storage are enable to operate at the same time for parking and retrieving process therefore it is faster parking/ retrieving time than other type. This type is to suitable for big scale basement parking space where it is regular width and numerous floors. •It is possible to platform the prompt parking /retrieving process by the separate operation of the lift and the cart. •Regarding a part of malfunction, the other part is not affected so whole system is not stop. •It is ensured the excellent safety by the double & triple safety devices. CP type a circulation type that pallets of same tier are gone in gear for horizontal movement of the tier but the pallets are separated for lifting of a pallet. This type is the most excellent using efficiency for underground space among the mechanical parking systems. •It is possible to be used to the limited parking space more efficiently. •It is suitable for small scale building due to the excellent space efficiency. •The structure is simple than other therefore the installation cost is cheaper. RP is simple rotary type. It is easy to control the system and the parking/ retrieving time is shorter, therefore it is possible to reduce the expenses of maintenance. •It is suitable for small & mid. scale building due to small installation area. •Due to the simple structure of system, the failure rate is less. •The parking & retrieving process is simple so no need the operation separately. 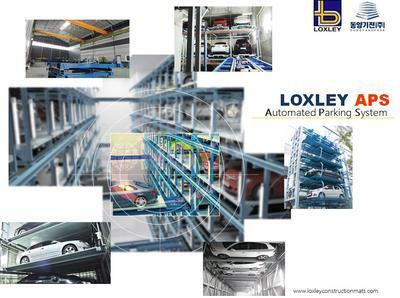 •The parking & retrieving time is fast so it is suitable for the building where it is high traffic density.